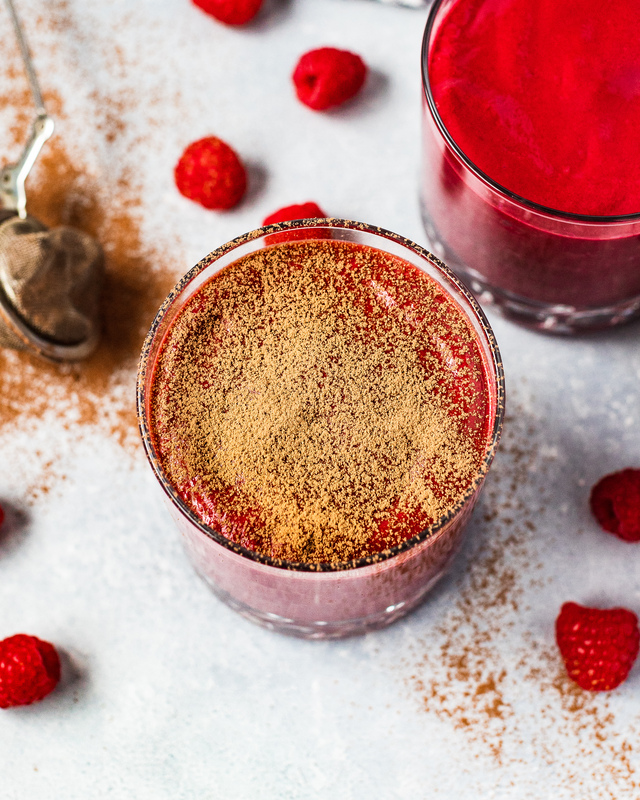 Velvety Beetroot & Raspberry Smoothie | Eat. Love. Namaste. I’ve been craving healthy alternatives lately for dessert. Some nights, we have a berry smoothie or a chocolate chia mousse. Getting bored with eating the same dessert over an over, I started jotting down ideas of what to make next. As I was trying to figure out what to make, I recalled the beet brownie bites I made over a year ago. I instantly knew it wanted to develop a smoothie version. If you haven’t tried beets and chocolate together, get ready to have your mind blown. These two ingredients are a match made in heaven, just as much chocolate and raspberries are meant to be paired. Therefore, I knew raspberries would go perfectly in this smoothie. I added avocado for creaminess, and dates for sweetness. 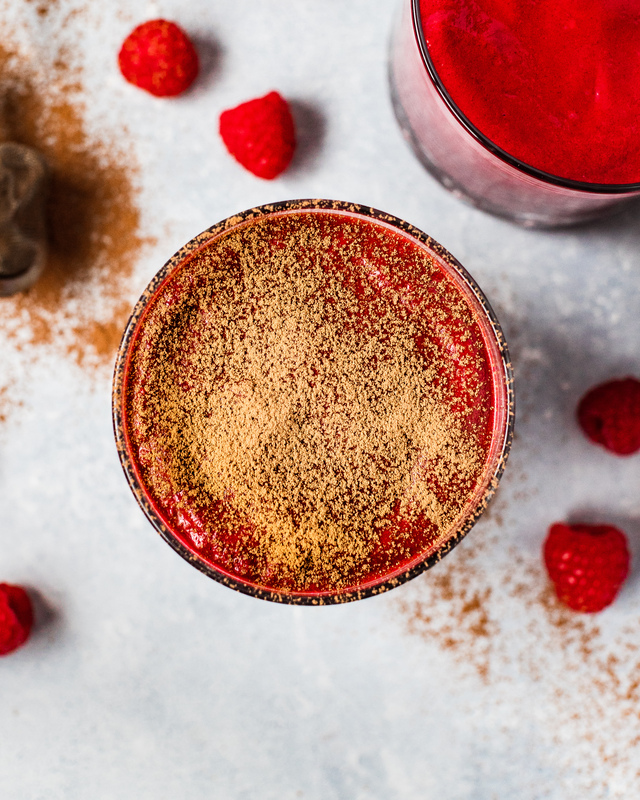 Blend with your favorite nut milk, and you’ll have a velvety smoothie. I use raw beets in this recipe as we own a Vitamix. If you don’t have a high-powered blender, I recommend cooking the beets first. I typically cook beets in a pot, filled with water over medium-high heat (bring water to boiling before adding beets) for about 15-minutes or until the beets are fork-tender. If you prefer this route, let the beets cool completely before adding to the blender. I prefer using frozen raspberries to make a colder smoothie. If you don’t have any, fresh berries will work, but you will need to add 1/2 cup ice. If you prefer a very rich chocolate flavor, add an extra tablespoon of cacao powder at a time. Taste and decide what your taste buds want. If you do not like beets because of their earthy undertones, you can skip the ingredient and go the raspberry-chocolate route. Jake does not like the taste of beets (his taste buds scream dirt and distaste), so I will make him this smoothie without beets, and I’ll add 1 small beet to mine. 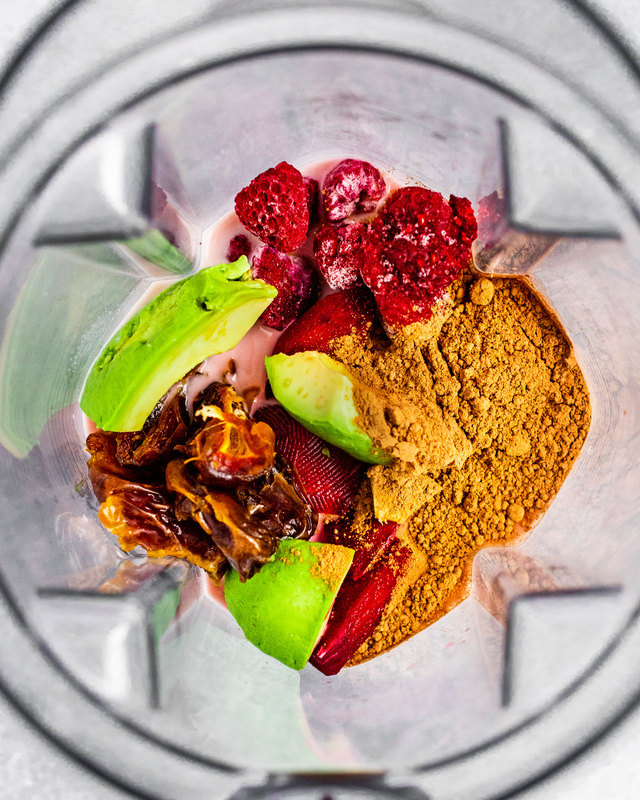 Either route you go, you will have a velvety, creamy, and tasty smoothie. Enjoy! 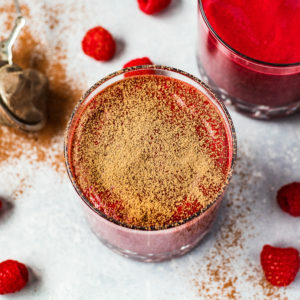 Hope you all enjoy this smoothie! 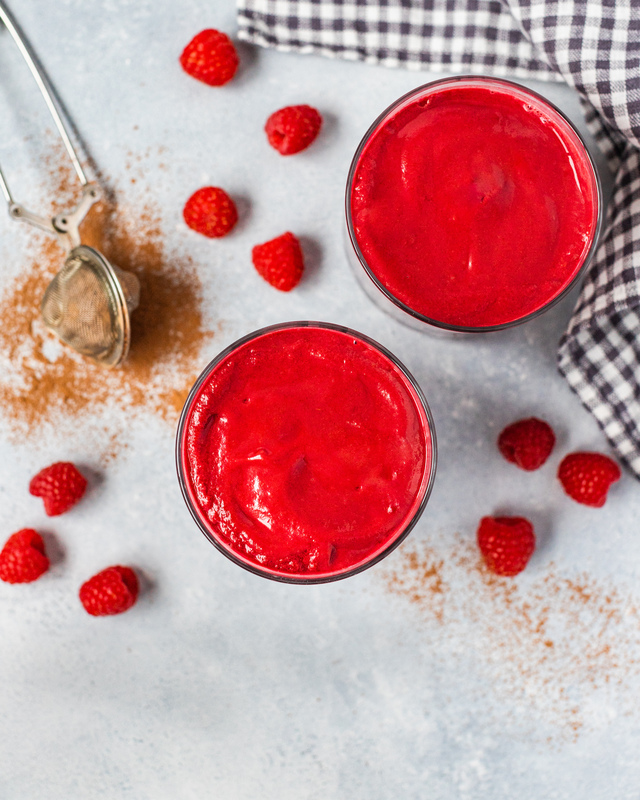 This Velvety Beetroot & Raspberry Smoothie is creamy, flavorful, and packed with nutrients. Place nut milk first to the high-powered blender. Add remaining ingredients and blend on high until completely smooth. Taste and adjust the flavor if needed: 1/2 avocado for more creaminess, an extra date for more sweetness, or 1 tbsp cacao powder for a richer chocolate flavor. Pour into two glasses, add desired toppings (optional) and serve. * use cooked beets if you do not own a high-powered blender. ** use soft dates in this recipe. If your dates are hard, soak in warm water for 5 minutes before adding to the blender.